Pictured from left to right: Msgr. 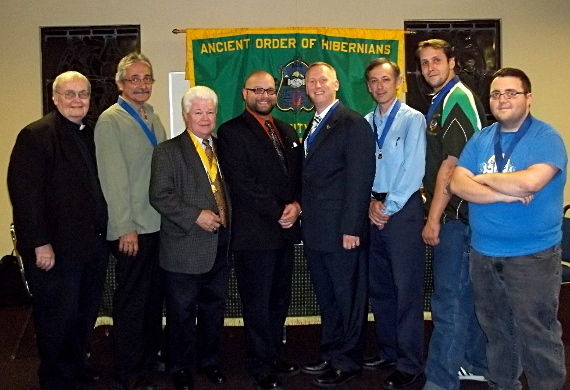 Herbert Tillyer, Gerry Donnelly, Jere Cole, Kevin Robinson, Michael Wallace, Pat Tuohey Jr., Jason Palisi and Michael Griffin Jr.
On Tuesday night, June 19th, AOH National Director Jere Cole visited Division 1 in Morris County to install the new executive board for 2012-2014. The installation was successful and the new board is looking forward to continuing the work of the order. The division would like to extend our thanks to Jere for taking time out of his busy schedule lead the installation.